Experience a real taste of the Highlands on this relaxing tour from Glasgow. Take time to visit a working whisky distillery, enjoy the scenic beauty of the Loch Lomond and the Trossachs National Park, discover historic Stirling plus much, much more! From Glasgow we make our way northwards to Stirling. As well as it’s majestic Castle the city is also famed as being the home of the Wallace Monument *, a Victorian tribute to the famous freedom fighter, Sir William Wallace. You’ll have time to visit the monument to enjoy the panoramic views and see the real "Braveheart's" impressive 1.7 metre broadsword. Travel northwards to the famous Gleneagles Hotel, famed for being the venue of the 2014 Ryder Cup. We’ll make a photo stop here before enjoying a drive through the picturesque Perthshire countryside. The attractive spa town of Crieff sits in the foothills of the Grampian Mountains and is home to The Glenturret Malt Whisky Distillery *, the home of the Famous Grouse. After a tour of the distillery there's an opportunity for a tasting and visit to the shop, a must for any whisky connoisseur! There are a number of trails if you'd like to enjoy a walk in the extensive distillery grounds. This afternoon we travel along the banks of Loch Earn and enter Rob Roy Country. This is the homeland of the famous outlaw, Rob Roy MacGregor and stories of his exploits are sure to entertain you! 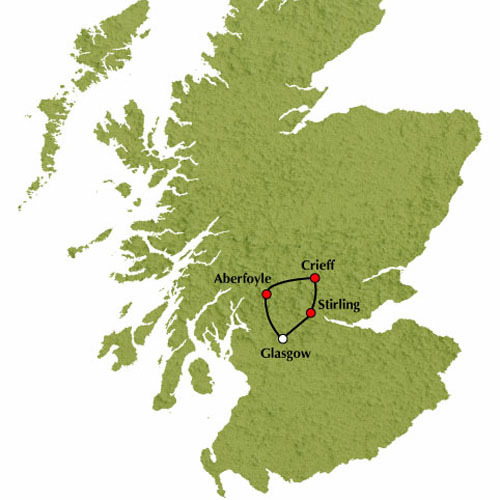 We’ll travel through the Loch Lomond and Trossachs National Park. This is a scenic land of heather clad mountains, picturesque lochs and sprawling forests known as "The Highlands in miniature”. We’ll make a stop in the attractive village of Aberfoyle before making our way back to Glasgow.